Last week I went to Sears in search of great Holiday fashion. I have heard a lot about the affordable fashion Sears offers and most recently, the Kardashian Kollection. I really, REALLY, wanted to see it first hand. I went in search of a dress but, the Sears location I went to only carried two dresses, in the entire store, in plus size. One was SUPER sparkly and the other was sleeveless, I do not do either of those. Stink! On to option 2.....pants. I posted my top 3 outfits on Instagram and asked you to vote for your favorite. I started with this combo. It is a pair of Black Boots, Black Pants and an Off-White Sparkly Top. It got the least amount of votes, of which I am not surprised. A few of you liked it, and that is AWESOME! But, it just did not look OK.
Next was this cute little combo. 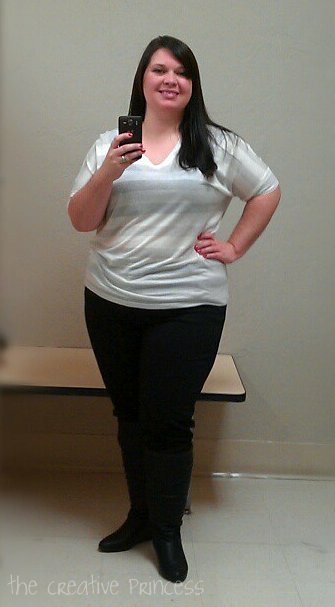 Again, Black Boots, Black Pants and way cute Black and Ivory Top. The top has heels, lipstick and bows on it, so girly! This was my FAVORITE and I was secretly sending you ALL telepathic messages to vote on this outfit. A TON of you voted and commented on option 2. Then came option 3. 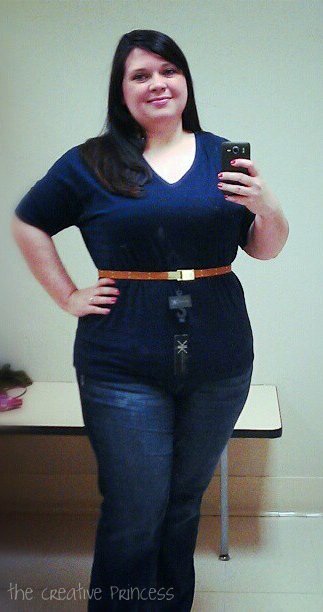 I loved this look, the jeans are my own, I paired them with a Navy Sparkly Shirt and a Skinny Brown Belt. Oh, this was cute! This was comfortable. This was SO ME! A TON of you picked this one as well. Option 2!! YAY!! I ended up getting the shirt, pants and boots but have lost just enough weight since last week that the pants are now too big. Stink. So, I just paired the shirt and boots up with some black leggings I already own. I absolutely LOVE this look! I was nervous about buying it, about the pants being tucked into the boots. About the boots! My gosh do you know how long it has been since I was able to pull boots on over my calves! AAHHH!!! I almost cried in the dressing room when they EASILY went on. I can not wait to rock this look on Christmas! Thank you ALL for voting! I also want to mention that I am STILL getting votes on these outfits and as of right now, option 3 is in the lead. But, since I had to purchase the outfit last week, I went with the winner at the time. I might go back and get option 3 though, it is pretty cute. If you still do not have your Holiday Outfit, use THIS COUPON to get 20% off your order! AWESOME! Be sure to also enter the Holiday #StyleSurprise Sweepstakes for your chance to win 5,000,000 ShopYourWay Rewards Points! OH MY STARS that ROCKS! I am a member of the Collective Bias® Social Fabric® Community. This shop has been compensated as part of a social shopper insights study for Collective Bias® and Sears. 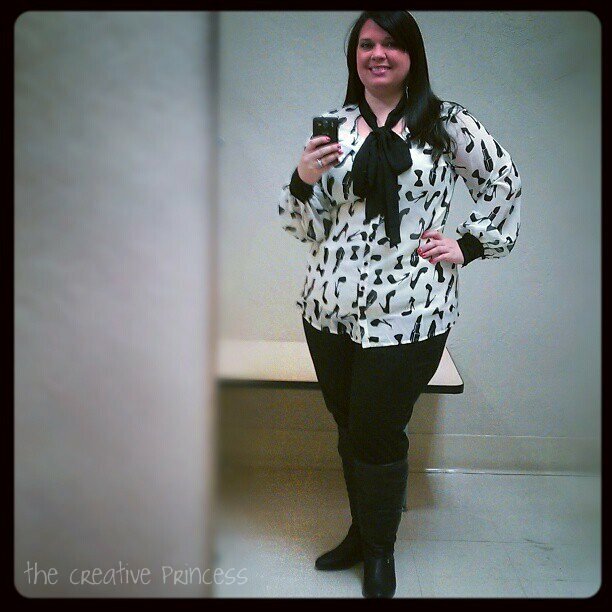 #CBias #ad #searsStyle All opinions are my own.